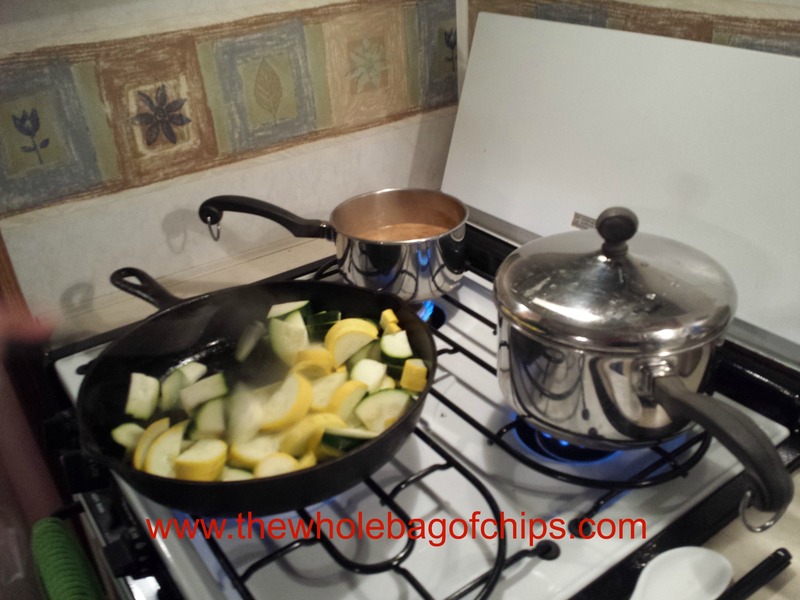 #crosscountryadventure2015: Not rain, sleet, snow or hail…. Nothing like getting the camper unhooked in raw, rainy weather. Not rain, snow, sleet or hail…. I love spring break. The weather is warm and spring-like with bright skies and cool breezes, as the green buds on the trees glow in the sunlight and the flowers are in bloom. Unless you’re planning a first-ever-in-your-new-camper camping trip. In which case it rains for two days straight, followed by colder than normal temperatures in which you experience torrential downpours, high winds reminiscent of the Wizard of Oz, and snow, sleet, hail and rain. Specifically the tail end of April. 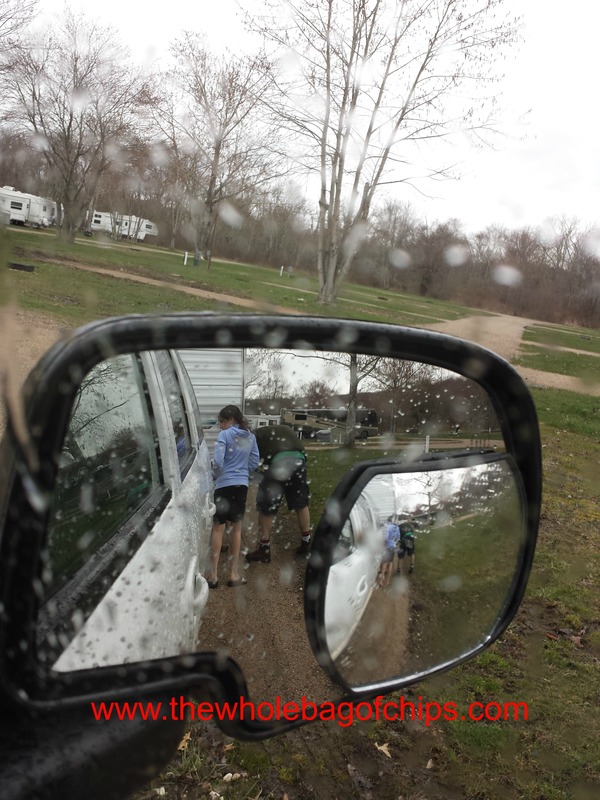 According to my husband, there’s truly nothing like the experience of backing a camper into a campsite for the first time, other than doing it in the midst of torrential downpours, and getting tire-spinning-need-four-wheel-drive-to-get-out stuck in the mud. Other than pulling it out in the midst of a hailstorm the next day. I seriously expected the world to suddenly turn to black and white and a witch to ride by on her bicycle any moment. But, we did it. Or more specifically, HE did it. We’d put off our first trip at the start of the week because of the two days of rain and high winds. The weather was so crazy that an entire tree in our neighborhood ripped out of the ground and fell across the roof of an empty house, so it seemed like we’d made a good decision in pushing it back a day or so, but as we looked at the extended forecast it seemed like it was now or never. The weather wasn’t going to improve a whole lot and if we didn’t go now, we weren’t going to get to go at all. We were losing our week. So we made a reservation for one night at a campground in Mystic CT., just a little under an hour from home. It was just far enough to be able to be away but yet close enough that if anything happened or we forgot something super important, we weren’t that far away. The first time hooking it all up to leave took some time, but we loaded in and went straight from our house to our kids’ elementary school where Don practiced backing up without hitting the school building, over and over again. After four or five successful back-ins, we were good to go and we headed to Mystic. One wrong turn courtesy of the campsite’s directions and we were suddenly driving our truck and the 30 foot camper right through the center of little historic Mystic, Connecticut. Not really what we’d intended, but it was a quick and dirty tour of Mystic Seaport and the surrounding area for the kids. People were opening car doors left and right, crossing streets without looking, and there was even a historic drawbridge thrown in there for good measure. The kids wanted to stay longer. Apparently our white-knuckled pass through wasn’t good enough. We promised them we’d take them back there another day, in a regular car, not in a caravan as long as our house. We were thankful that campfire cooking wasn’t our only option. Other than the crazy weather, the overnight itself was thankfully uneventful, and we had a lot of fun. We had a slight issue with figuring out how to light the camper’s pilot light, which proved to be stressful at first, but once we got it, the problem was solved. The dog adjusted just fine, and was surprisingly well behaved, after having been out in the camper with us all week long as we’d done our prep work and clean-up. We had thought of our meals ahead of time: turkey burgers and turkey hot dogs, sautéed zucchini and squash, potato salad and baked beans for dinner that first night, and pancakes with sausage for breakfast that next day. I had a basket of boxes chips, crackers and cookies as snacks and a big bag of cereal on hand, just in case anyone got up early before breakfast and got hungry. That happens at home pretty regularly, so I tried to think of everyone’s eating habits and address them ahead of time. Because of the rain, we couldn’t really go out, but we were somewhat exhausted anyway, so we were happy to stay in. 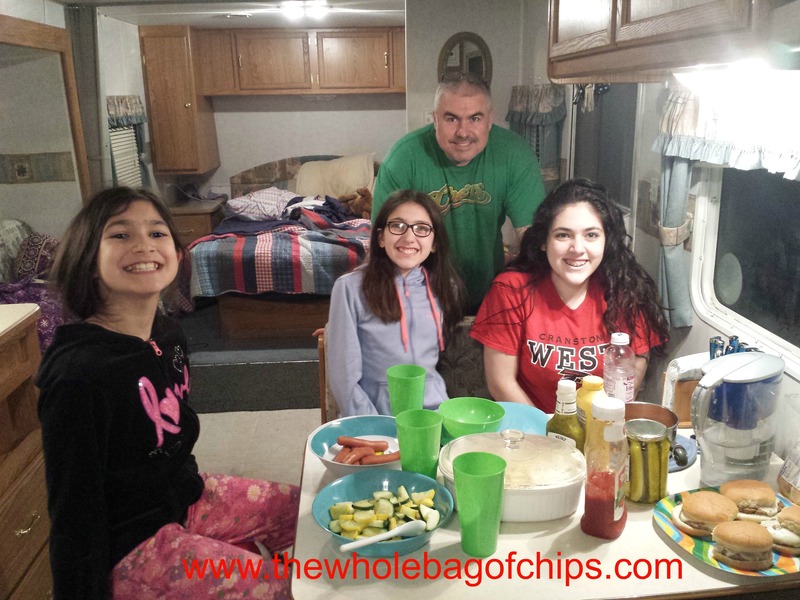 The kids hung out all together in one bed, watching an old show on one of their tablets, and we hung out, tinkering around the camper. I had brought about a dozen hand-painted canvases with me that the three of them had completed in an art class. The work was so beautiful and I’d hoped to be able to use some of it to decorate the camper, making it more of our own space. Our regular house isn’t large, and there’s not a ton of display space there either, so between the two spaces, I hoped to showcase their talents and brighten up the camper at the same time. Many of the pieces would work very well with the color scheme we had chosen. I also wanted the kids to choose some pieces for their “rooms” so that they could personalize their own spaces, especially our oldest, as she was going to be sleeping in the common area. I wanted her to have a chance to make some of that space her own as well, just as they could the bunk house. I’d purchased two big packs of medium sized Command strips and they were great for adhering the artwork to the walls. We all went to sleep at the same time and we were all up in plenty of time in the morning to get everything cleaned up and packed up and ready to go by check out. Other than the 32 degree temps and the hail, even that went well. We had snow flurries at home when it was time to back the camper back into the driveway, but all in all, we had a successful trip. We’d meant to work out any kinks, and we did. We experienced more types of weather in 24 hours than we ever would on the summer trip, but it was a trial-by-fire type of trip overall, the kind of thing you just can’t make up. A fun memory and a good story for our kids to tell when they get older. Adventure is all part of the fun!